Day 2 of the three-day 80 mile ride. This photo is towards the end of the 30 miles for the day. We need this ride to complete our 2014 ECTRA Versatility. My luck? It will be 50 degrees and raining all three days. Averages for this time of the year (September 17-18-19) are mid-seventies and rainy. Lucky me, the temps were PERFECT. Low 70’s, no humidity and sunny for Friday’s 30 miles and Saturday’s 30 miles. Sunday got up to the low 80’s, but we were finished with the ride’s 20 miles by 9:43 am so we missed having to deal with the heat rising. Miss Daizy is doing three days, 80 miles. Steel and Ann will be doing one day, 30 miles. Now to convince Steel that she most certainly can be alone in her stall on the two days that Miss Daizy goes out without her. I am going to miss riding with Dom and seeing Mike’s beautiful photos. Dom is in her own crisis right now with her horse Ozzy needing daily meds for his bout with EPM. My prayers are with her. Dom’s most recent update is that her horse is responding very well to his meds and she’s hoping for a good recovery. I am too! I am also hoping that Dom will be able to finish out the year riding Steel at The Mustang Memorial 50 mile endurance ride. Before I even being this story, for all of you reading this that couldn’t sleep at night Thursday, Friday or Saturday because Steel was doing her own 100 mile ride in her stall the entire weekend, I APOLOGIZE! I knew she has stall-claustrophobia when I purchased her. And I knew she was antsy in the stall at the Brookfield ride, but I had NO IDEA that she would pace and call out the entire time we were at the Chesapeake ride. I have learned a very valuable lesson. TRUTH! Steel will no longer attend any rides in which the facility requires the horses to be stalled. She is absolutely fearful and anxious in a stall and even with her constant pacing and weaving, she still managed to do the 30 mile ride with a good showing. They completed 11th out of 48 riders. Imagine how well Steel and Ann could have completed had Steel not worn herself out the two days before the competition. Poor Steel. She lost about 100 pounds this weekend and I am so sorry I put her through that. Never again. If a aride requires stalling only, Steel will not be attending. And now, onto our 3-Day 80 mile CTR adventure. A couple days before the ride, a Facebook message went out to the ECTRA group that Beth was in need of hitching a ride with someone because her trailer axle was broken. Since she lives just south of me, I (of course) volunteered my extra slot in the trailer to help her get to the ride. Little did she know she’d be stuck camping with me (chuckle). Sandy was going to be riding Steel but was having some vet issues with her horse so didn’t have the funds. Sadness overwhelms me as Sandy had to let go of her mare the day after the Chesapeake rides. We are all very sorry for her loss. I searched high and low for another rider for Steel. Two riders down and gotta find one!!! Nicole (bless her heart) found one for Steel the weekend before the ride (whew). I took Steel and Miss Daizy up to visit Renee the Sunday before Chesapeake so that Ann could ride Steel and get a feel for her. Ann loved her and agreed to ride her in the 30 mile CTR. So, I had everything packed but had to unpack and change things around to fit Beth’s gelding in the trailer. Beth agreed to put my “third slot stuff” in her truck and follow along behind me to the ride. Little did she know that the traffic was going to be SO BAD that a normal two hour trip took us almost 4 hours. It’s Thursday. Early afternoon. Where the heck is all this traffic coming from??? I will never understand Philadelphia traffic. I texted Cate (the ride manager) to let her know we were running behind due to traffic and were going to arrive right around 6:00 pm. A little later I texted her again to let her know it would be closer to 6:30 pm. A little later I texted her again to let her know it would be 7:00 pm. Just so you know – I am not texting and driving! Every time I texted her, we were at a complete stand still on Route 476. I put the truck in park before sending my text. I was in a panic because Cate wasn’t texting me back and the ride agenda specifically said that any horse not on the grounds by 6:00 pm could be disqualified. I also knew that darkness is now arriving by 7:30 pm and I had two horses to get vetted, stalls to get setup and camp to setup. At some point, before we merged onto I-95, I lost sight of Beth’s red truck and I didn’t know if she got ahead of me or was far far behind me. I figured I was in a large rig standing out in a crowd, she could find me. I had to “drive my own drive” with this stop and go traffic. Finally … about 10 minutes before arriving at base camp, I get a text from Cate letting me know that it was all good. I could be late becuase she knew I was the infamous Dodie Sable and I am never on time. I screeched into base camp, got my ride packet handed to me through the window of my truck, then I screamed over to get a parking space by my stalls. Beth was no-where to be seen so I threw the horses off the trailer and ran Miss Daizy over to get vetted before it was too dark to see her anymore. Steel, tied to the trailer and out of Miss Daizy’s site, was screaming her fool head off. Miss Daizy started to get agitated because she could hear Steel but couldn’t see her. Dr. Nick is trying to get all her existing boo boos recorded and Miss Daizy is dancing on his head. While I was getting Miss Daizy vetted, I heard “RIDE MEETING”. OH MY GOSH! I screamed back to the trailer and tied Miss Daizy next to the dancey prancey Steel and ran down to hear the ride briefing. I am totally out of breath by now and my adrenaline is running on overdrive. Three Day 80 milers … pink loop then orange loop for Day 1. 30 miles. Got it. Cate grabbed me and asked if I would ride point with her newbie rider on Perfect Poe. “Why sure! I would love that!” Poe and Miss Daizy rode together before and their pace is just about the same even though Poe is a full hand taller than Miss Daizy. Alex is riding Poe and this is her first ever CTR ride – and Cate is subjecting her to a 3-Day 80 mile ride? Cate, what the heck? So Cate ran me over (in the dark) to meet Alex. I hope I remember what she looks like tomorrow. We decided to set up our hold stuff right in front of Poe’s stall so that would be easy to find Alex in the morning … just look for my stuff and it doesn’t matter if I remember what she looks like. Of course, I still have to get my stuff over there. OH CRAP, my two horses are still tied to the trailer and it’s dark. I saw Beth at the ride briefing so I know she arrived safely. When I got back to the truck, she already had her gelding untied and gone, so she must have found her stall and got it set up for him. She was a wonderful soul! She grabbed straw and set in front of my two stalls for me. I brought straw with me, but since the ride was providing a bale per horse, let me use theirs and save mine. 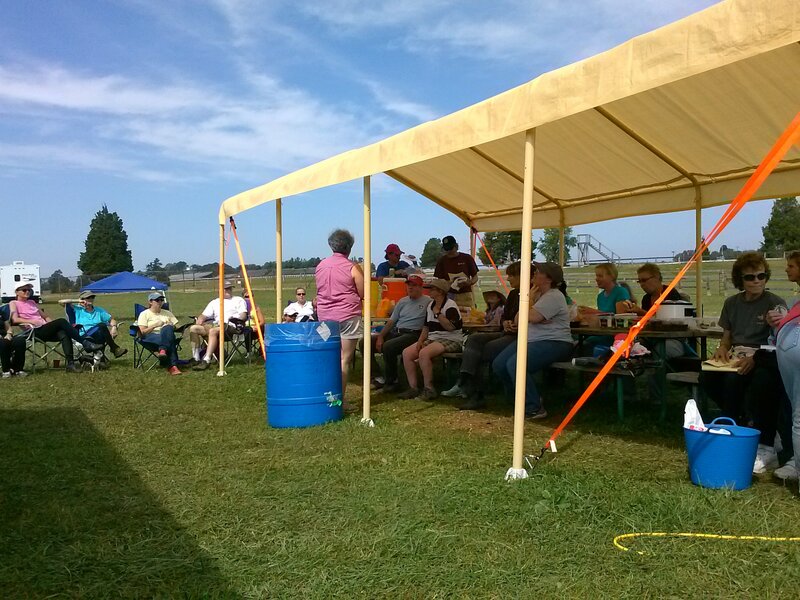 Grabbing buckets from the trailer, I lugged everything over to the two stalls and set them up. Shook out the straw and put in some hay and their feed pans. Then I took the hold stuff over to Poe’s stall and set it all up ready to rock and roll. I leave home with everything pre-measured in baggies so setting up the hold is very quick and easy. Cate told me that she would fill the buckets with water, not to worry. I very quickly realized that I was short on electrolytes. I thought I had six of them, but turned out I only had five. Well, I saw Mary Coleman running around so I knew I could buy one from her before I would need it on Sunday. Time to set up my own camp. It’s pitch black, the wind is picking up and I have to set up my tent without llighting. Why? Because my extra special super duper 9 million lumens flashlight that Paula gave me is dead dead dead. And (of course) the batteries it takes are some kind of funky short stubby little things that I do not have spares of in the ride box. I dug out a lantern from the ride box and that helped some. Good thing that I have been setting up this tent for 15 years and I know exactly how everything goes together otherwise I’d be sleeping outside for the first night. Beth was ready LONG before I was! She had her bed all setup in the back of her truck and she was ready. I decided I would hold off on setting up the canopy until tomorrow so after I had all my sleepy stuff in the tent, I sat in my chair and breathed. Until I realized I could hear Steel screaming. A lot. I said something to Beth and she told me that she had been hearing that horse the entire time I was setting things up. I was so focused, I didn’t even notice. I walked over to the stalls to see what is going on. Let me describe these stalls first. They are large and airy however, the sides go all the way up and the horses cannot see the horse next to them. The doors are a metal mesh that they can look out and see into the courtyard, but they are unable to see anything in the stalls beside or behind them. I liken it to being in a jail cell, totally cut off from everyone. Steel is spinning around and around in her stall calling and callling for Miss Daizy. I look over at Miss Daizy and she’s getting agitated by Steel’s hollering and she’s standing with her head pointed towards Steel’s stall, weaving back and forth. This is not good. Not good at all. They need to settle down and rest. Miss Daizy goes out on trail tomorrow morning at 6:45 am to run 30 miles. If she’s weaving all night because Steel is crazy freaked out, I’m not going to have any horse underneath me. I go into Steel’s stall and she immediately pays her head on my chest and sighs. Okay, at least she’s quiet for the moment. I look at her feed pan and she hasn’t touched her grain. Her hay flakes are still flakes meaning she hasn’t even nibbled at them. Her water buckets are still full, nothing drank even though she was on the trailer for almost four hours. I brush her off a little (hard to do as she is drenched in sweat) and leave her stall to go have a talk with Miss Daizy. As soon as I close the door behind me, she starts spinning in her stall and hollering again. I go in with Miss Daizy and she has eaten all her grain, drank a bucket and a half of water and has her hay all messed up. I refill her water buckets and etll her to knock it off and go to sleep. We have an amazing day ahead of us and getting all worked up about Steel’s insecurities is NOT going to help her any. Shaking my head, I walk back over to my camp and tell Beth that I may have a dead tired horse in the morning. There is nothing I can do about it. Steel will either settle down, or she won’t. Miss Daizy will either get over it, or she won’t. It’s all up to them at this point because I can’t sleep atanding up in Steel’s stall so she’s quiet. I grab my pajamas and head over to the showers so I can clean up before going to bed. On my way over there, three different people stopped me to let me know that Steel was dancing in her stall. And I know Steel has the horses around her agitated as well. Now I’m the bad guy. I hate being the person with the maniac horse. SLEEP … And I did, on and off. I woke up a couple times because I could hear Steel hollering out. Whoo Hoo … riding for Day 1. They said that coffee would be ready by 5:45 am so I quick ran up to feed my two girls and found that both of them had worried in their stalls all night. Straw was pushed all the way against the wall and Steel was walking back and forth and back and forth. Miss Daizy was staring at me through the door, asking where the heck her breakfast was, didn’t I notice that the horse next to her had breakfast already? And her straw was pushed all the way up against the wall. Neither one of my girls had rested last night. No matter, it is what it is. I gave them their breakfast (thank goodness, Steel had stopped pacing long enough last night to eat her grain and mess around in her hay.) Filled their water buckets and brushed Miss Daizy. It’s dark. It’s 5:47 am. Where is the coffee? Several of us were milling around, crying huge tears of agony, worried that we would have to start our first loop on no caffeine in the tank. Ben quickly came over to give us tissues and tell us that he had a coffee malfunction so it was going to be a bit late. I saw a chocolate chip muffin so I snagged it and started munching on it while I waited anxiously for coffee. I looked at Mary’s watch and it said 6:01 am. How the heck am I gonna drink coffee now? I have to be saddled an on trail in 45 minutes, just about the time the coffee will want to leave my body. Six times. I turned to leave, figuring I could take ice tea with me on trail for a caffiene boost when I heard someone behind me screaming in joy. I glanced over my shoulder to see what was going on and there was Ben, setting up the coffee pot. He was almost trampled by 20 riders all rushing towards to the container with their cups ready to fill up. Well, I guess if I have to stop and pee, Alex will learn one of the basics of distance riding. Peeing. Not just for the horse, but for the person, too. I fill my mug, and it’s nice and strong (THANK YOU BEN!) I love my coffee so thick that a spoon will stand at attention when put in the cup. This was very very close to that. Excellent coffee. I rush back up to my camp to change into riding clothes and drag my gear up to Miss Daizy’s stall. Let me tell you, it was quite a feat to hold my mug in one hand and load up the other arm with saddle, pad, bridle, beast collar and helmet. I refused to give up that mug! I needed it. Now, allow me to digress for a moment. I had purchased an Equipad as a second pad for my saddle. It’s nice, with a smooth woolen surface against the horse. My main pad is a Skito with a fuzzy woolen surface against the horse. Both pads have 1/2″ foam inserts and fit my saddle perfectly. I decided to use the Equipad day 1 (because it’s newer) and the Skito day 2 and then go back to the Equipad Day 3. Remember this for later. I pulled Miss Daizy out of her stall and Steel immediately started screaming and rearing up against the wall of her stall between her and Miss Daizy. Time to get one and go find Alex. I surely hope I can remember what she looks like. I walk Miss Daizy over and I feel like something isn’t quite right. Oh, yeah … helmet. Get your freakin’ helmet Dodie. I asked someone (I don’t know who it was) to hold Miss Daizy a minute. I dismounted and ran back to the stalls to get my helmet. Steel is spinning around faster than any kid’s top. I can’t worry about that. We’re out in four minutes. I grab my helmet and race back to where Miss Daizy is standing, looking bored to death. I love this mare. She never (ever) gets worked up about the start of a ride. Such a change from all the other horses (except Shark) that I have ever competed on. They are usually so wound up that the first 5 miles is riding with my heart in my throat, death grip on the reins, and hoping against all the odds that I survive. I don’t have a mounting block anywhere near me so I step into the stirrup and swing up. before I get my other leg over, Miss Daizy trots off down towards the pink trail. HEY! Wait for me, silly mare. Alex and Poe are ready. I am ready. Miss Daizy was already ready. We’re off. Pink trail was fast (and kinda boring). Mostly long wide open fields. Miss Daizy has her groove on and she’s cantering left lead. Then right lead. Then left lead. All is well. She feels wonderful beneath me, relaxed and in a groove. Trotting on the down hills. I look behind me and she is pale. We are big trotting down a long hill and she is turning green. I forgot. She’s new to this sport. I ask her how she is and she says that Poe is slipping. I get it. There is heavy heavy dew on the long grass in these fields and he probably doesn’t have cleats on his shoes. I slow Miss Daizy down. She gives me an ear twitch like, “What the hell Lady. This is a downhill, where I excel in my big trot.” I lean forward and explain to her that Alex is not used to traveling 10 mph down hills and we needed to let her get comfortable with that. Miss Daizy nodded to me in understanding. She also winked at Poe to let him know she’d kick it back up a notch on the next up hill. And she did! Cantering left lead, then right lead, then left lead. I so love that I easily taught her to do flying lead changes. Keeps things interesting. We were moving so fast that I started letting them stop and eat. The dew on the grass was so heavy that I new every bite they took was giving them water, too. The two horses were thrilled with me. Trot a mile, eat. Trot a mile, eat. We crossed some creeks and Poe was drinking. Good! Miss Daizy doesn’t have time for that drinking nonsense, so while he drank, she filled her belly with grass. There were many many places on trail that had her favorite grass to eat. I believe she thought she had died and went to heaven. Poe and Miss Daizy burned up that pink loop. We came into hold at 9:06 am. This is with many many pit stops for eating and drinking. I (however) did not need to pit stop … to get rid of the coffee … but in hold, once I dismounted, I tied Miss Daizy to the water bucket and flew to the bathroom. Now that I had my pit stop, I ran back to the horses and checked the time. Three minutes to pulse in. Miss Daizy was happily eating Poe’s food. Get out of that, Miss Daizy. Cate said not to worry about it. Poe was eating her food, it was all good and there was plenty to go around. That Miss Daizy, she is such a chow hound. I actually think she gains weight at a ride, she eats so much. Ten more minutes and we’re out on the orange loop. I asked Alex how she was doing. She said she was having fun. Not much conviction in her voice there (chuckle) but she was game! Shse was hoping that the sun was going to burn the dew off the grass. Well, it is only 9:26 am when we start out on the orange loop so I don’t have much hope for that to be happening. Fortunately, the orange loop is more Miss Daizy’s style of riding. Single track trails through the woods. She is ON! Big trot, in and out of the trees, twisting and turning and having a grand time. When we break out into a field, she turns on the gas and give me a nice center. Once field was long long long and I let her race for a minute. Her hand gallop is amazingly smooth and comfortable. I have my eyes on the ground looking for holes and ruts, she has her eyes on that orange pie plate way out there across the field. I look back and Alex has a death grip on Poe. I ask Miss Daizy to slow up a bit and she wiggles her ears at me. Yes, really – slow it up Miss Daizy. Alex needs to slow up. We trot across the field and I ask Alex how she’s doing. Uh oh. I forget that not all horses are like Miss Daizy. She just goes whatever speed I ask her to do with very little reins needed. We enter into the woods and Miss Daizy settles in behind Poe. I told her to watch because it’s rumored that he kicks silly mares that tail gate. She understood and kept a good distance behind him, on a loose rein. Poe leading did not last long. He very quickly asked to be behind Miss Daizy again. We scooted front on a wide section of trail and I missed the orange marker turning us to the left. I was looking down the trail to the right, seeking the confidence marker and Miss Daizy cut left so hard I almost fell out of the saddle. I started to pull her up when I saw an orange confidence marker on the trail that Miss Daizy picked. Alex thought that was way cool when Miss Daizy picked the correct trail and I didn’t. So we’re in the lead again and I can see that alex is very relaxed on the the single track trail moving along in a big trot. Note to self, take it easy in the fields so Alex and Poe don’t have race brain. In and out of trees and into the fields. Coming to woods again and I’m looking at a trail opening on the left when suddenly Miss Daizy shifts to the right. Almost unseating me. Again! Oh, I see, an orange pie plate off to the right at a different trail opening into the woods. WOW, Miss Daizy is following orange trail markers all by herself. Is this possible??? I decide to put it to the test. I told Alex what I was going to do so that I have a witness. at the next trail convergence, I am not going to steer Miss Daizy, I am going to sit back and let her pick the trail. We got to experience the experiment about another mile down trail. Three trails coming together. Which one will she pick? How the heck is she doing that? How cool is that? WOW MISS DAIZY! So, a little while later, Poe gets into the lead again as we cruise along the creek. We are traveling pretty nicely when all of a sudden we make a right turn onto a covered bridge. Conversation went like this. And as soon as we cross the bridge, with Miss Daizy in the lead again, we make a left. Ahead of us on the trail is a whole lot of metal thing-a-ma-bobs that I have no idea what they’re for, but the conversation went like this. Oh my gosh. This was probably the funniest part of the day. The kids all saw us standing there but the two young ladies in care of the children didn’t see us. We were stopped, standing there waiting to be noticed when I asked one youngster who was grinning at me, “What are ya catching today?” They had tupperware contrainers of water and green aquarium nets. Uhm, we actually are already stopped. Duh! And then, with great panic in her voice and body movements, she shouted to the kids to all move back ten feet. She’s waving her hands all over the place shooing the kids back away from us. In rapid fire english (I think it was english), spewing spittle in her frenzy to be sure we don’t mow her down (because even though we’re just standing there staring at her, our horses can OBVIOUSLY mow her down in a split second) she starts shrieking at us. I point at the very clearly marked trail right behind her. Of course, she had not moved … and neither had she moved the pile of fish nets, or the stack of tupperware out of our way, but Poe and Miss Daizy daintily, and easily, maneuvered through their obstacle course to reach the safety (and silence) of the trail on the other side of the creek. I didn’t dare let them stop for a drink because I was sure that poor woman would think we had contaminated the water or something. And on we went down the orange trail. We hit the section that Alex had helped Cate mark and she was very comfortable with where we were. I asked her how long a section it was, because we had not passed a mile marker and I knew we had to be close to the 5 miles to go. She said she didn’t know. Shortly thereafter, we passed the 5 miles to go and go we did! Boogying along, I felt like we should have passed a 4 miles to go. Then a bit later, I felt like we should be at 3 miles to go. We get onto a track that I’m pretty familiar with and see that we’re at the 2 mile bridge again. Okay, now I know we have about 2 miles to go. Ben had promised to have the orange trail markers up this morning, but Miss Daizy is burning up trail so fast, we must have beat him to it. It’s all good, we are running with plenty of time. I ask Beth for time and she says 11:02 am. Crap … okay, make that LOTS of time. We’re going to need to kill some time or we’ll be coming in too early. Time to eat. And eat they did! Poe and Miss Daizy trotted 1/4 mile then stop and eat. Trot 1/4 mile, stop and eat. Repeat as necessary. We reached the little creek that is about 1/3 mile from base camp and we stopped and sponged and sponged and looked at the watch for time. We walked in from there and arrived in base camp at 11:59 am. Time to ride a 30 mile CTR is minimum 5 hours to maximum 5.5 hours. We split it right down the middle. Our horses had full bellies and were plenty cooled off. I dropped Miss Daizy’s saddle and only sponged her enough to get the sweat and dirt off. I let her eat everything she could while I waited for the 20 minute pulse in time. Pulse 42. Respiration 16. Over to Dr. Nick for a safety check and Miss Daizy got all A’s. I did notice (however) that when Dr. Nick ran his hand over Miss Daizy’s back, she flinched. That is not typical of her so after I got her stuff all set up at the hold for the next day’s ride, I went to check on her in the stall and found that her back was tender. Whenever I touched it she scooped out from underneath by hand. Not like it was sore, but like it was brush burned and very sensitive. Uh Oh … we got two more days to do. Steel is still spinning in her stall. I was told by a couple people that stayed in base camp that she was actually quiet for an hour or so. Really? Guess now that Miss Daizy is back, she’s not so quiet. I cleaned their stalls and fluffed the straw back into the middle. let’s see how long that lasts. Right now, camp is very quiet. There are not that many of us riding today (2 riders in the 100 mile and 8 riders in the 80 mile) I settle down to watch all the Saturday riders come in and park. We’re told that tomorrow there will be near 100 horses on trail between the five different rides. 15 milers, 30 milers, 50 milers, 80 milers and 100 milers. I was able to read one chapter of my book before someone came to visit. 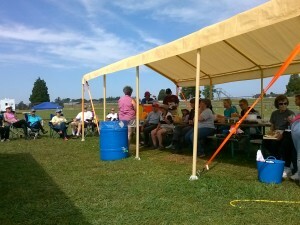 Then more people came to visit. Then Ann and her husband Kevin showed up. Ah ha! Let’s talk about Steel and get her vetted in. I filled Ann in on Steel’s will to complete the 100 mile ride, all mileage done in her stall. I told her to not be surprised if she’s tired the next day. I also told her that once she was in the saddle, Steel would “do her job” and it would not be a problem. Cheryl came over with Crash (after texting me ten times to find out where I was). Without me even noticing, she snapped this picture of my camp (and Beth’s camp, we shared). Once again, Cheryl surprises me with the best pictures. This one definitely says a thousand words. 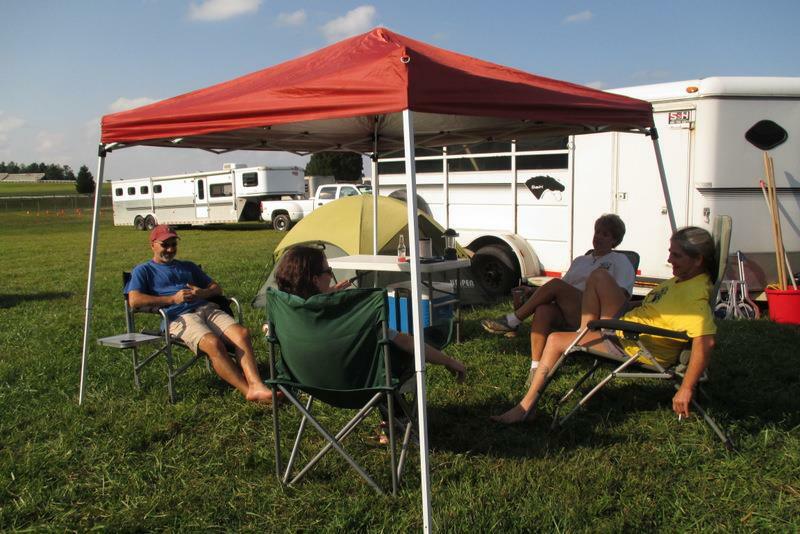 Good times, good friends, good conversation and relaxing the night before the next day’s ride. I was very enthusiastic as I felt really good after completing the Day One 30 miles. My back was not sore. My mind was clear. And Miss Daizy was a rock star. In the back of my mind, that sensitivity on her back was bothering me, but I had put away the Equipad and got out the ratty Skito pad. Hopefully, it won’t get any worse tomorrow. We went to dinner and had the ride briefing for Day 2. For us 80 and 100 milers, same trails as Day 1. Pink, then orange for the 80’s. Guess we can’t get lost (keep that in mind) We then returned to our own personal camp to visit with each other until late into the evening. Beth was excited. Ann was excited. Kevin was more interested in where he could run the next day so I told him to chose the yellow loop and follow the ribbons like he was on a CTR. I finally got up and said I had to go to bed as I had to be in the saddle at 6:45 am. Everyone else said good night and off we went to bed. I slept until 3:30 am when Marc (my sweet husband) sent me a text and the phone went “uh oh”. I jumped up and answered it. We had some serious sexting for about 30 minutes then he signed off to go to bed and I was left sitting there wide awake. Finally, at 4:30 am I decided it was time to just get up and do stuff. I fed the girls before any other horse got fed and that made them very happy! Miss Daizy did not stall walk last night as her straw was still all in the middle. AND! Bonus, she had laid down and rested. I know because she had poop stains on both sides of herself. Steel, on the other hand, had walked all her straw against the wall again and she definitely had not laid down to rest. She was still as pristine as she was when I bathed her before we came down to the ride. Oh, man. Her skin is still sensitive. I know it’s not her muscles, it’s just the skin. Like she’s been brush burned. I don’t know what to do other than change her pad back to the skito. In a CTR we are not allowed to use any kind of linament, powder, oil, etc etc because it can affect how the horse works. I guess if she’s suffering while riding today’s 30 miles I’ll just pull her. Next year will be here soon enough and we can try again for her versatility. Ben walked through camp at 5:00 am waking up all the 96 riders going out that day. He also shouted that coffee was ready. 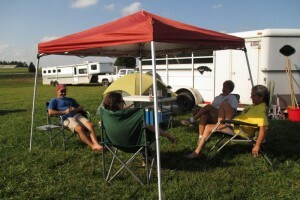 I quick grabbed my mug, poured in some chocolate creamer and headed over to the breakfast tent. Mmmmm. Strong coffee and today I have plenty of time to “coffee in, coffee out” before I get on to ride. Ann is excited. I can tell because she’s talking a mile a minute. I show Miss Daizy’s back soreness to Ann and Kevin and express my concerns for finishing the ride that day. I tell her that Steel had been stall walking all night and she was going to be tired. I gave her the run down on eat, pee, poop, drink. And I gave her a hug and told her that she would have a great ride on Steel. It was soon going to be light enough for our morning trot out safety check. I quickly saddled up Miss Daizy and took her over for her check. I held my breath as I trotted her down and back, sure that the pressure of the saddle on her back soreness would cause her to be off and get pulled. Dr. Nick gave me the thumb up. Good to go. Now, for the real test. Would she buck me off when I got on her. She never has before, but that doesn’t mean she won’t protest today. Nope, I got on and could feel her settle into her rider weight and get ready to go. 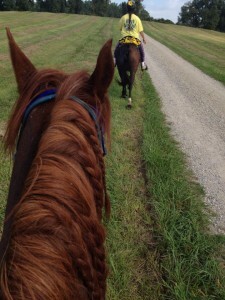 I was a little tender in the hamstrings and upper calves as I settled into the saddle, but everything else felt great. I sure didn’t feel like I had ridden 30 miles the day before. I was beginning to be hopeful that we would get through 3 days of hard riding and win Miss Daizy her ECTRA Versatility. And we’re off. Pink trail then orange trail. Just like yesterday. This was Alex’s view for the entire ride. I think Poe only went out front once on the second day. Alec told me he felt tired and she was glad that Miss Daizy kept out front and made him motivated. Without much more to say, we had only one small adventure on the trail Saturday. When we got to that covered bridge again, there were three labs jumping into the water after sticks that their owner were throwing. The splashing and thrashing in the water was very concerning to both Miss Daizy and to Poe so I had to get off and walk her across the bridge. For safety sake as I didn’t want her to spook on the wooden bridge and slip and fall. When we got to the other side, a woman driving by stopped in her car while I was mounting and told me she loved the yellow color scheme and the daisy on my helmet. She’s about the 20th person on the trails to tell me that. After she drove off, I turned to Alex and asked if she was glad (or sad) to be riding with a loud yellow person. She just smiled. Saturday’s ride went a little slower as Miss Daizy and Poe seemed a bit bored by it all. We didn’t miss any markers and we came in to mid hold at 9:11 (5 miles slower than the day before). Yes, we were definitely moving slower and because of that we made less eating stops along the way. Miss Daizy seemed okay with me on her back and was moving freely so I didn’t panic. Second loop, onto the orange again, Miss Daizy and Poe left the hold like they were headed to the gallows. Dragging feet and looking back over their shoulders. We were getting close to coming in to finish when I started seeing horses with lower numbers. The 50 milers and 30 milers. Wait … really? Because no-one had passed us so how did they get in front of us? I heard one rider say that his GPS said they were 5 miles off somehow. We followed along behind several of these riders and I kept wondering how they got in front of us. Into base camp we came in at 11:59 am. Exactly the same time as the day before. our horses rock. Alex and I did a high five and got off to let them eat while we wait for our 20 minute pulse time in. I quick found Cate and told her about the riders in front of us. She said she knew about it and they had been course corrected. Okay. I wasn’t tattling, but I was concerned that they cut off 5 miles somehow. Trail markers do get messed with by non-ride trail users. They think it’s funny to move our trail markers. I do not think it’s funny at all. Final P/R for the day 2 of the ride for Miss Daizy is 42 pulse and 10 respiration. And when I took her saddle off to run my hands over her back, it was miraculously cured of its sensitivity. I’m guessing that once she warmed up and had her old pad back on, she got to feeling better. I put her away with hay and grain and went back out to the hub-bub of the 96 riders coming into hold and started helping to hold horses while riders sponged. It got warmer today than yesterday. About 10 degrees warmer! I still didn’t sponge Miss Daizy much. Just enough to get the trail gunk off her. She is an amazingly rapid recovering horse. After the last of the riders came in and I could see I was not longer needed to hold horses, I went to find Ann and check on her ride. She said that Steel did marvelously and her final P/R was 42 and 18. WOW, after she had already done 50 miles in her stall for two days, she had that great of a recovery after running 30 miles carrying Ann. What an amazing little mare she is. Just started her endurance career this year, at age 15, and she’s doing better than a lot of young horses. I went up with Ann to do her Hands On and watched as Steel received very few corrections. Ann did a very good job with her. 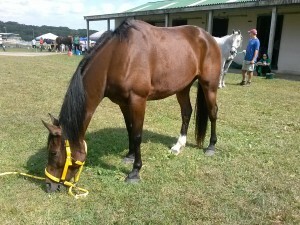 Ann and Steel finished the ride 11th place out of 48 riders in the 30 mile CTR on Saturday. I am very proud of Steel and especially want to thank Ann for riding her and taking good care of her! 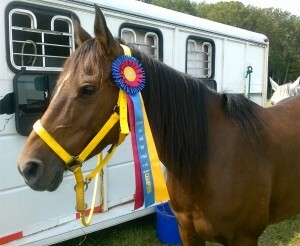 LeeAnn and Handsome Jack earned Reserve Champion for the 30 mile ride. She was so excited she cried. I knew exactly how she felt. 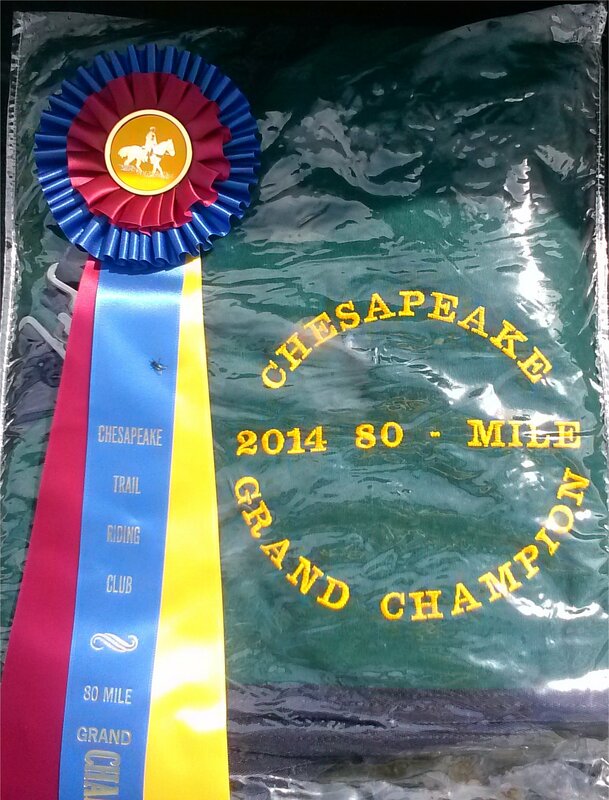 At the Spring Chesapeake 25 mile CTR, Miss Daizy got Grand Champion. It was my first ever GC win in 15 years of competing. I cried, too! Ann and Kevin had already left before the awards so I collected the prizes and ribbons that Ann and Steel won to give to her next time I saw her. She said she would ride Steel at Ride For The Ribbons in NJ. Hopefully I would see her before then, but if not, I will give them to her then. Beth had a good ride on her little gelding. They completed. She was a bit tired but disappeared off to someone else’s camp. LeeAnne was visiting with Corinne and Tiffany who came up to just ride on the trails the next day with Tiffany’s new mare. So I was all alone in my camp. Now to read some more of my new book. I have to say, that didn’t last long. I fell asleep, face down in my book. I woke up around 11:00 pm feeling refreshed, and totally not able to go back to sleep. I started reading my book again when Deb came over to Georgia’s camp, which is directly behind my camp, and they started talking about Georgia’s accident at Master The Mountain in July. I got to hear first hand what happened and how Georgia got herself out of it. WOW. I will not tell that story here because it is not my story to tell … all I will say is that the “real story” is far different from all the stories I heard third and fourth hand. And I will say that Georgia gets the Dodie Award for “One Tough Hombre”. She walked over five miles on a broken leg to get herself to safety, with no cell phone service and no glasses to see with. Kudos. Okay, around 2:00 am I fell back asleep, face first in my book, and was abruptly awakened at 5:00 am by my alarm barking at me. OH MY GOSH! Day 3. 20 miles. 20 very fast miles. We only have 2 hrs 45 minutes to 3 hours to finish those 20 miles. I climb out of my tent (groaning as my back said ouch) and ran over to feed the girls. Once again, Steel cruised her stall all night. I know because Kevin had cleaned their stalls yesterday and fluffed everything back into the middle and Steel had hers all pushed against the wall again. Miss Daizy’s stall was flattened. She must have laid down all night long. Every bit of hay was gone from her stall. Both buckets were as close to empty as you can get. She was ravenous and inhaled her grain, so I gave her more grain (which she quickly vacuumed up) and she was bright and alert. Coffee and a banana is all for me! I ran back and cleaned up Miss Daizy. No tenderness or soreness in her back. Amazingly, the Skito pad must have magical powers because she’s completely healed. And yes, we’re riding in that Skito pad again today…even if it is dirty and yucky from yesterday’s ride. I saddle her up and go over for our safety trot out and check in. Dr. Nick gives us a thumbs up. We’re ready to go. I find Alex and ask her how she feels. She said her inner thighs are sore but other than that she feels great. Nice thing for her, she lives about 5 minutes away from the base camp so she goes home each night and sleeps in her own bed. That surely has to help with not getting overly sore! Today we’re doing the yellow loop and a modified orange loop. Apparently, Ben modified the orange loop a little too early yesterday ad that was how every one was getting off trail and losing 5 miles. They were all sent back out on trail to do the correct loop so some of those people yesterday actually did 35 miles instead of 30 miles. Ben did apologize about the mistake. I’m sure he got cussed at a lot. Kate had lost her riding partner the day before. Lyndsey pulled her horse because he was slightly off and our motto as endurance riders is “Save the horse for another day”. Always! If anything seems amiss, we always pull the horse from the ride and fix it. Never push the horse. Never! Anyway, I told Kate to ride with me and Alex. Then, I thought I should ask Alex if that was okay. I am so rude sometimes. Alex was good with that. Kate is a hoot and I love her humor but had never actually ridden with her before on trail so I was kinda excited to have time to get to know her better. NOTE TO THE READER! We are now a group of three rookies! None of us have ever done a three day CTR before. Although Poe is the only one experienced at this three day competition thing, his rider Alex is a complete newbie to the sport and he wasn’t much help as he spent 95% of the ride behind Miss Daizy. Since I hadn’t been on the yellow loop, when we left on our start time I was paying close attention to the ribbons. A couple times I took turns and Alex (riding right behind me) commented that she was glad I was in front instead of her because the yellow ribbons are hard to see and she would have missed them. It was quite foggy when we left at 6:47 am and we were in the woods on single track trail. It was gloomy for a little bit after we started. Kate’s horse (a nice mustang gelding named Fez) did not have shoes behind so I called out to her several times if she was doing okay. The single track trail is relatively nice, with some rocks here and there. We were moving at lightning speed, though, and while Alex had grown numb to Miss Daizy’s pace, this pace setting was new to Kate and her gelding. I wanted to be sure that we didn’t lose them or cause them to go faster than they wanted to go. Oh yes, single track track. Miss Daizy’s favorite kind of trail We were booking it. I mean, like really moving, even cantering as we wove in and out of trees. She was doing flying lead changes all on her own as we raced through the gloomy woods. Any gymkhana rider would have been very impressed with her agility that morning! We rapidly caught up with Patty and Jeff who started before us. Then we passed them. Then they passed us. Then we passed them. And most of the first 10 miles on the yellow loops went like that. We came off the single track into a field and Miss Daizy took full advantage to put distance between her and them. We got into the lead with a good distance between us and held it most of the way back into base camp. 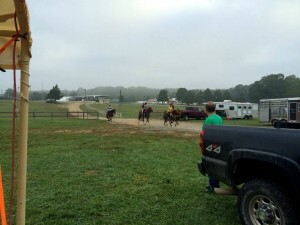 They caught up to us as we entered into the round pen area to switch out to the orange trail. We did ten miles in one hour and four minutes. Miss Daizy is “ON”. She was ripping up trails like no-one’s business. When we got to the turn around, I asked Alex and Kate to give me 5 minutes so I could grab an electrolyte from my camp. Miss Daizy was moving way too fast and furious to stop and eat or drink so I wanted to be sure she didn’t get a metabolic imbalance. Mary was sitting there when I said that and she jumped out of her chair and offered me the elyte she was holding. She even gave it to Miss Daizy and flushed her mouth with water afterwards. I didn’t have to dismount or anything. MY HERO! Thank you Mary! You put a smile on my face. And we’re off. Modified orange loop. 10 miles to go. We have one hour and twenty minutes to finish at maximum time. Miss Daizy kinda dragged her feet leaving the hold. She was confused because coming into hold usually means she can stuff her face and all she got this time around was a mouthful of electrolytes. Kate took over lead for awhile as her gelding didn’t care a hoot that we were leaving the hold. He marches right on down the road to get on trail again. Once we hit the trail, Miss Daizy cranked right back up again. We got out into the lead and she was on fire. About a mile into the ride we came up on Patty and Jeff. Patty’s horse had stepped into a rut and went down, throwing Patty right onto her head. She said she was okay and so we passed them. Here we go again. We’re out front, they’re out front, etc. We come to a huge long field. Remember that field from the first day where Miss Daizy galloped across it? Yep, that field. Now, remember, these fields are not flat, they have rolling hills to them. This particular field is three ups and two downs before you reach the other side. Miss Daizy doesn’t care, she gallops up and she gallops down. I had already warned Kate that Miss Daizy was a downhill horse and would big trot down every hill she came to. I slow us down to a flat walk. Miss Daizy is not happy but Kate and Fez needed a minute to have a discussion about bucking while galloping down a hill. Discussion is over and I let Miss Daizy big trot the rest of the field. I glance over at kate and I have the biggest smile on my face ever. “Isn’t this the funnest ever?” I ask her. “Yep!” she answers. She’s smiling, too! We are making great time. Good, because I want to stop at the deep creek under the 2 mile bridge and let Miss Daizy cool down and drink. My plan was working pretty well – for a minute or two – then other riders showed up and got her all agitated. She stopped drinking so I walked her into the deepest part where the water was over my feet in the stirrups. I started sponging and cooling her down. We blasted until we reached the little creek a third of a mile from base camp. We sponged a little bit then walked in from there. Right on the money, we arrive 3 minutes before our cut off time. Of course, no-one was there to take a photo of it (chuckle). I miss Mike Turner and Cheryl! They take the best photos. Just a side note, the yellow loop rocked and it was definitely my favorite loop (and had nothing to do with the color of the ribbons). Thanks Ben for making such beautiful trails for this ride. Pink was fast. Orange was fun. Yellow was the bomb! Okay, down to business. Get the saddle off. Back feels good. Sponge and sponge and sponge. It is much hotter than the past two days, even though it’s only 10:00 am, and we just busted out 20 miles without a real break. Sponge and sponge and sponge. Water on, water off. Miss Daizy is stuffing her face and has me all covered in gooey slurry stuff. I borrowed Brenda’s stethoscope and did a pulse on Poe. 48, good. Did one on Miss Daizy. 44, good. Time to go get our pulses done. Final 3rd day pulse for Miss Daizy was 44. Her respiratory was 12. She has completed 80 miles in three days. I completed 80 miles in three days, too. And my back is telling me all about it. I actually had to beg Sarah to trot out Miss Daizy at the end because I wasn’t sure I could do the circles. I was not walking very well, and was pretty sure I couldn’t run at all. Sarah did (THANK YOU!) and Miss Daizy trotted out beautifully for her. Now we wait for hands on. I cleaned up Miss Daizy and could not find any boo boos or soreness. Her back felt great. Her legs felt great. She was still bright and perky and eating everything in sight. I tied her to the front of Steel’s stall and gave her hay, grain and water. I stripped out her stall while we waited. Over I go and as far as I could tell, she had only one thing against her, some filling in her hind legs. I knew she lost a point for being over 40 pulse. That’s okay. She just did three days and 80 miles, she’s allowed to have a 44 pulse instead of the CTR recommended 40 pulse. Hands on is done, I tie her and Steel to the trailer and strip out Steel’s stall. Waiting for lunch and awards. I start breaking down camp. I have a lot of energy for some reason. I don’t know why, I should be bone weary. But I’m not! My back is achey and twingy but other than that I’m not sore anywhere and I feel great! Everything is packed. LUNCH CALL! Cate always has the best prizes. The awards meeting was very small compared to yesterday! There were two 100 milers, seven 80 milers and I don’t exactly remember, but I think there were sixteen 50 milers (two day ride) to collect their completions and prizes. I am going to encourage everyone I know that rides CTR to try a three day. It wasn’t hard at all! And next year I am going to go for the 100 mile. I feel great! I oo’ed and ah’ed as the 50 milers got their prizes. She started on the 80 milers. First place – not me and she stopped at first place so that she could do the special awards. Reserve and Grand for the 80 mile ride were not announced. Since we hadn’t received any award yet, I knew the Miss Daizy was either Reserve or Grand. I was dying to know. I was jittering in my seat while Cate handed out special awards. Cate announces that Miss Daizy won Best Arabian in the 80 mile ride. WOW. I was astonished that she finished well enough to be considered for either Reserve or Grand *AND* she won the Best Arabian award. Cate gets back to the 80 mile ride winners and says Reserve Champion … and it’s not us. 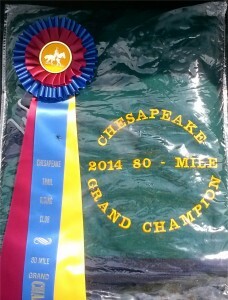 We got GRAND CHAMPION at the 80 mile Fall Cheasapeake CTR. And I am still astonished by Miss Daizy’s strength and work ethic. And I am amazed that I survived three hard days of riding with very little soreness or pain. I can hardly wait to go home and write this story to tell everyone how special to me is my little 14.2 hand pony, MIss Daizy. Look at her in this photo. She’s not sunk in or tired looking. In fact, she was dancing around waiting to get loaded in the trailer. She’s quite a wonderful mare. Thank you to every one that has supported me this year. We are having a really great year. I don’t know why, but I will treasure all Miss Daizy’s awards this year with all my heart. The ride home? It was a breeze. No traffic and we sailed along to Beth’s house to drop off her gelding without one single hitch. Now why can’t getting TO a ride be so easy???? I am sharing this story from Erin. She lost her horse at the Chesapeake Fall 2014 ride and there were several mis-communications, conjectures and rumors going around about why her horse was sent over the rainbow bridge after the ride. I share it because we all know that freak accidents can happen and this loss is especially devastating as she only had her horse a couple weeks and this was their first competition together. I am saddened by this tragic loss and my heart and hugs go out to Erin. I’m not really sure where to begin this so I guess I will start with the good part- the ride. It went great. Seleighe was a rock star for the race. We had a few miles of race brain and sure I felt like a water skiing monkey clinging on for dear life at times, but we finished all 15 miles at exactly (to the minute) in the time I wanted to finish in. He pulsed down right away, we did our hands on, turned in our evaluation paperwork and loaded up to head home. As we were headed down the driveway at Fair Hill, I happened to glance at my side view mirror at the same time a group of riders started screaming and waving at me to stop. I stopped the truck and jumped out to see both of Seleighe’s front hooves stuck through the top slat on trailer. How he did this, I still don’t know? It seems like it is not quite possible in the way of physics but we all know that horses pretty much spend their lives trying to hurt themselves. He got one foot unhooked by himself and it took three of us to get him untwisted and lifted enough to get the other hoof out. At first glace, the damage didn’t appear too bad- there was a cut at the back of his pastern but it was small and wasn’t bleeding much at all. Unfortunately he wouldn’t put any weight on it and was getting panicky as I tried to hold him in the trailer. By this time, several people had come down to help and we got him out of the trailer and into the shade. I tried to get a hold of my vet but she was out on calls so I called Unionville Equine (the vets we use at work) and had their emergency service come out. I knew from my experiences working in several different vet situations that the area that had been injured was a critical one as far as tendons go and the fact that he wouldn’t bear weight on it was not a good sign so I tried to keep him calm and in the shade until the vet got there. When they arrived after some directional challenges, they heavily sedated him, gave him some pain meds and blocked the nerves in his lower leg so that they could explore the injury. I knew it was bad when the vet said “Erin I know you know that this is a very serious place to have a laceration, come look at this”. Seleighe had sliced completely through the superficial flexor tendon and almost through the deep digital flexor tendon and you could feel the pastern bone easily. After a phone consult with the surgeon at Unionville, the thought was that he had a 50/50 chance of ever becoming sound enough to even be a pasture pet and that would be after surgery and a very long rehab process. Talking it through with the vet, I decided that I could not put him through that and that it would be best to euthanize him. The vet and ride management found a suitable quite place there and we gave him enough sedation that he would be comfortable to walk there. I won’t describe any more but I do have a lot of people who I need to thank. The equestrian community is truly awesome- everyone from the people who helped me get him unstuck from the trailer, to the ride manager Cate, to fellow rider Beth who offered me her own horse’s stall for Seleighe if I needed it, to my friend Pam who stayed with me while we put him down, and the vets Dr. Kopec and Dr. Joy who did absolutely everything they could to make a terrible situation better- I appreciate each and every one of you.